MIME (Multipurpose Internet Mail Extensions) is a specification for displaying file formats. On browser`s request, Internet Information Server sends the MIME information and the requested file. Each file must have a defined MIME type that to be served from IIS to a browser . 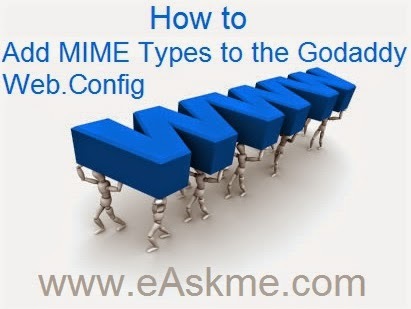 How to Add MIME Types to the Godaddy Web.Config ? How to create Web.Config File to Allow .xltx Files ? Enter code of MIME. Click to copy the code on MIME. Save this file as "web.config". In address bar of windows explorer enter FTP address of your website. Enter username password and login. Right click task bar and select "Windows explorer". Drag the web.config file and drop it in FTP server.